Cheers to a new year. I wish you all 365 days of consistent striving and thriving. Throughout the month of December, I shared a variety of planner styles. I want to be of service to my fellow readers and help you find a tool that works best to manage your day to day lives and crush the chaos. Per usual, I wanted to share my planner lineup for 2019. If you’re trying to decide which planner to use be sure to check out my planning series for more information. Welcome to another Plan As I Go here on the blog. This Plan As I Go is a cola with YouTuber, Creatively Jas, using the Pastel Marble kit from the Etsy shop EmmasCorner. will have all of Jas’ info linked below for you to check out plus her full spread. As always be sure to click the links throughout the post for related posts and links to purchase items/similar styles used. January has come and gone and I wanted to recap my planner layouts for the month. I went back to the basics this month of planning by incorporating more printables and page flags from the Target One Spot. As my Etsy stash is dwindling there are stickers that I’d like to purchase/repurchase, but I want to use what I have before doing so. Be sure to click the links to head to the original post which features links to all stickers used. I wasn’t a fan of my January spread at all. I tried to create this winter wonderland the theme, but I just ended up oddly placing snowmen and penguins. I also tried to color coordinate my bills versus appointments and birthdays. The monthly spread is meant to be a guide for me, but if I don’t like it, I barely refer to it. Going with an all blue theme and trying to stay true to that really threw me off. Tip: Find a specific use for your monthly spread whether it’s to mark bills/appointments or as a blogging tool. Don’t try to cram everything in the boxes. Make use of your sidebar! For this spread I used a combination of printables from ThreeCheers+Co, MyPlannerEnvy, and NinjaMomDesigns. this was my first time doing an all out spread featuring printables and I love how it turned out. The only thing I would’ve like to have done differently was fill out the bottom more instead of having so much empty space. I did for two days out of the second half, but that’s one thing I worked on the remainder of the month. Tip: In using printables, don’t be afraid to mix and match various ones. Also take your time cutting them out. This week was basic and a great example of inexpensive planning for beginners. I used scrapbook paper n the middle, left over page flags that I had from various Etsy shops and everything else was basically a Target page flags. I used them to mark my blog posts and TV shows plus my ‘To Do’ headers. I loved this spread because of the simplicity and how easy it was to achieve. I didn’t need to washi the bottom and subconsciously the scrapbook paper matched. This layout I was able to pull in multiple colors that complimented each other so well. Tip: Experiment with what you have. Do not continuously buy to keep up with other planners. Grow your stash according to your personal budget. This was a super cute, pre-Valententine’s day spread. This was the first spread that I played around with washi simply by cutting the ends. I also used another MyPlannerEnvy printable for the ‘To Do’ lists. I wouldn’t mind having those printed on regular paper opposed to glossy paper. The only thing I’d swap out is the bottom washi for a different alternative. Tip: Try picking a color for a specific spread and experimenting with all shades. I planned an owl theme in my head for this spread, but it’s my least favorite of the month. Maybe adding Olaf to mark the blizzard wasn’t a cute idea after all. The entire bottom half is crooked. I filled the white space with washi that I forgot I had purchased. Looking closer at this layout Olaf really does throw it off, but the crooked glued on instagrams don’t help either. Tip: Don’t overthink your theme. Let it flow and add accordingly as the week progresses. This layout is definitely my favorite of the month. I love it because it’s bright and another theme that semi works as another pre-Valentine’s day theme. It was bright and vibrant and was great to look at throughout the week. Being that there was a lot of snow on the ground, it was great to look at my planner and stay motivated throughout the week. Tip: Have fun with your spread and don’t limit yourself to a specific season. Keep it bright for motivation. There’s nothing like checking something off your to-do list. Welcome to another plan with me edition. Last week I did a fall theme using stickers from the Etsy shop Pineapple Paper Co. I am a part of the PR team for the company and I wanted to share the stickers that were sent and show how I would use them in a layout. For more details on Pineapple Paper Co click HERE and to see my plan with me from last week (11/2-11/8) click HERE. Below is my layout from last week fully filled in. I had a lot of fun tracing the stickers. First thing I did differently for this layout was switch up my blog/social media and my daily to-do’s. I’ve never done the Morning/Afternoon/Evening or for you Erin Condren lovers Morning/Day/Night (MDN in the planner world). On top I usually put my blog/social media posts, middle has my TV shows for the week and once before my school work, and the bottom my personal daily to-do list. I decided to switch the top and the bottom and I moved my Weekend banner to the middle section. November is Lung Cancer Awareness Month and the colors of lung cancer are white so I was generally going for a black/grey/white theme. Bland as far as color scheme compared to my other layouts, but in using these colors in a printed form I thought it would work. I ended up using adhesive paper that I purchased from Michaels for my full boxes, but little did I know that they were transparent. I’ve created full boxes with scrapbook paper, but with this thin paper it was more difficult. I didn’t like the direction that I was going so I took a step back from planning. I was overthinking the layout since I was recording a video so I went to sleep Saturday night with a half planned layout. I woke up bright and early Sunday and I finished with adding a pop of blue. I was thinking pink, but I haven’t solely added blue to a layout before plus I had a decked out planner layout in October (10/5-10/11). In adding the pops of blue the layout started to come somewhat together. I’m still not sure what I’ll be doing to the sidebar. Right now there’s just black washi. I’ve been loving putting scrapbook paper in the sidebar and layering stickers from there, but I didn’t have any scrapbook paper that really worked with the chevron that I was using. No video this week since I just wasn’t feeling this layout, but let’s consider this a blog “exclusive.” Check out the layout below and stickers used/similar styles will be linked. Enjoy! Welcome to another plan with me. Last week was my birthday spread and I absolutely love how it turned out. I used a lot of pink (#gopink) which coordinated well with the previous week I did as well. In creating my layout for this upcoming week I enjoyed using the full boxes. When writing on them into the next week there’s no bleed through. It makes it easier to use the Sharpie Fine Points. Check out my spread completely filled out below and click HERE! 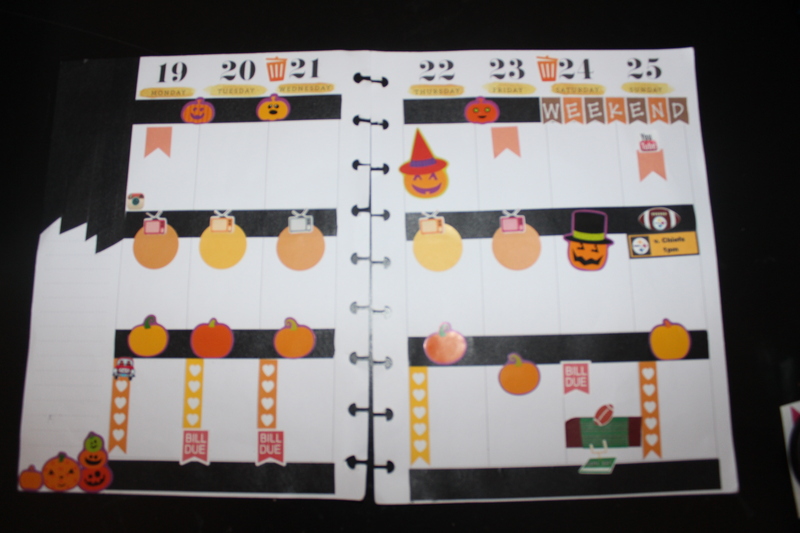 In planning for this week I used a Darice sticker book, “Spooky Pumpkin” which I had also used in my October layout. As noted above, I really liked using the full box stickers, but for this spread I didn’t have any. I stuck with the color scheme of black, orange, and yellow. I would have added in some orange washi tape, but the one I have is a bit sheer so I stuck to black. Initially when planning I had added ghost washi tape on the bottom, but as I continued with the orange/yellow color scheme, I took it off and stuck to the black washi tape. I wanted to do something different in my sidebar and not the traditional TV show stickers I use. I used the TV stickers from RorysSweetAddictions and layered them with large circular dots that I have from the Michaels Recollections calendar stickers. I usually don’t like long To-Do lists, but this week I hope to fully use them. I have found that while I like shorter to-do lists, the first three days of the week are pretty busy. I also was shorthanded on headers which is something I plan to purchase from Etsy soon, so I used the plain pumpkins and just wrote in To-Do. The layout overall is pretty empty, but I can’t wait to add and layer throughout the week. Direct links to stickers/washi used will be below along with my weekly video. Enjoy!